All students should graduate from high school ready for college, careers, and life, prepared to pursue the future of their choosing. o Mastery of rigorous knowledge and skills in core academic disciplines, including English language arts (ELA)/literacy, mathematics, history, civics, science, art, and music. Content knowledge and skills in mathematics and ELA/literacy are foundational to the study of all other disciplines, and high school graduates are often asked to demonstrate competency in these subjects before they can begin further study (at two- and four-year colleges), enter certain job training/apprenticeship programs, or pursue the military career of their choice. 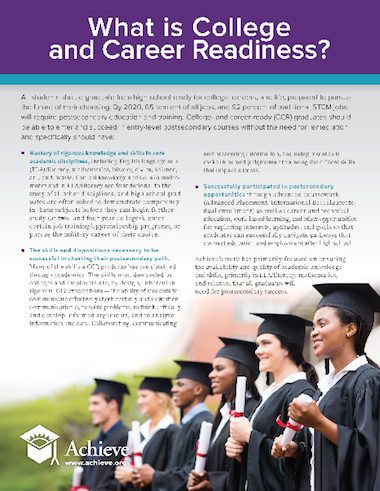 o The skills and dispositions necessary to be successful in charting their postsecondary path. Many of the skills a CCR graduate has are obtained through academics. 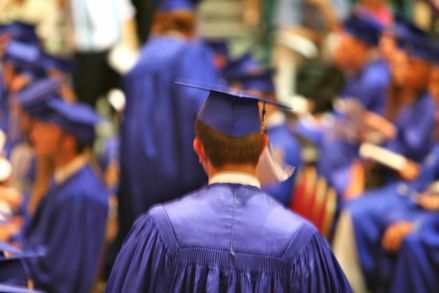 The skills most demanded by colleges and employers are, by design, inherent in rigorous K–12 expectations – the ability of students to communicate effectively (both verbally and in written communications), to solve problems, to think critically and develop informed arguments, and to analyze information and data. Collaborating, communicating and presenting information, and using research to make informed judgments are among the critical skills that impact success. o Successfully participated in postsecondary opportunities through advanced coursework (Advanced Placement, International Baccalaureate, dual enrollment) as well as career and technical education, work-based learning, and other opportunities for exploring interests, aptitudes, and goals so that graduates can successfully navigate pathways that connect education and employment after high school. Achieve’s work has primarily focused on ensuring the availability and quality of academic knowledge and skills, primarily in ELA/literacy, mathematics, and science, that all graduates will need for postsecondary success.